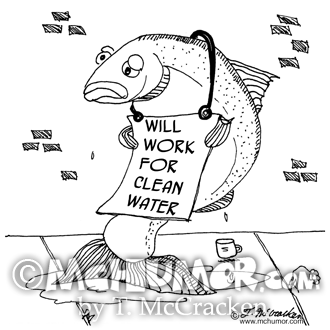 Environment Cartoon 7030: A salmon panhandling wearing a sign, "Will work for clean water." 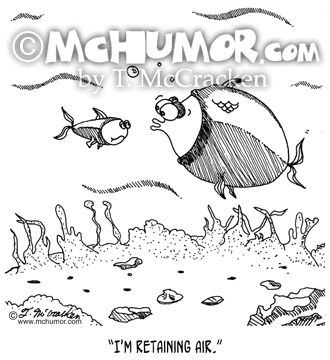 Diet Cartoon 6531: A really bloated fish saying to another, "I'm retaining air." 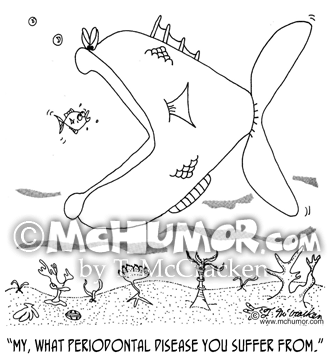 Fish Cartoon 5360: A little fish about to be eaten by a HUGE one says, "My, what periodontal disease you suffer from." 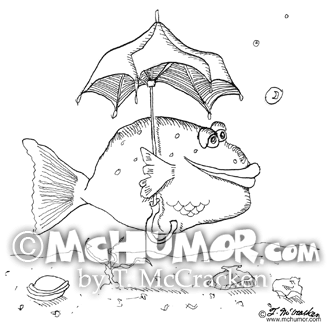 Fish Cartoon 1230: A fish swimming with an umbrella. 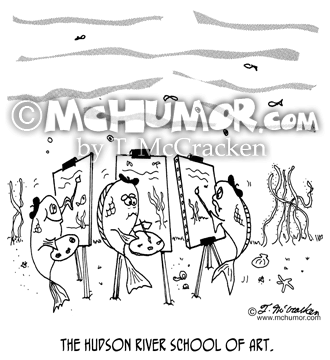 Fish Cartoon 5012: "The Hudson River School of Art." 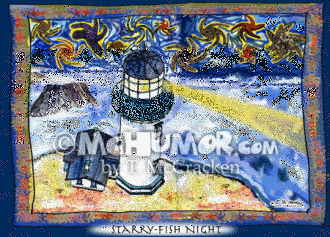 A bunch of fish painting under water. 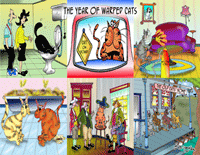 In addition to cartooning, I paint watercolors and draw scientific illustrations. 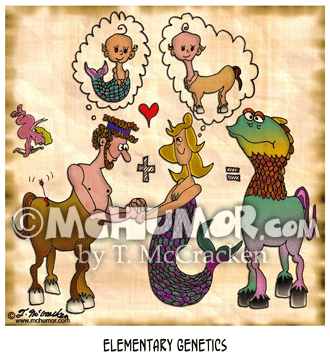 My series titled UnNatural History is a combination of all three. Someday they will be part of a book that's a whimsical look at my life as a naturalist. 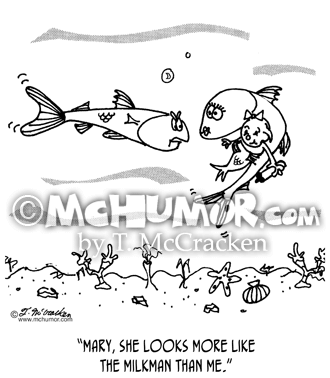 ... and yes, I know jelly and starfish aren't really fish, but I wasn't sure what other cartoon pages to put these two cartoons, so cut me some slack. 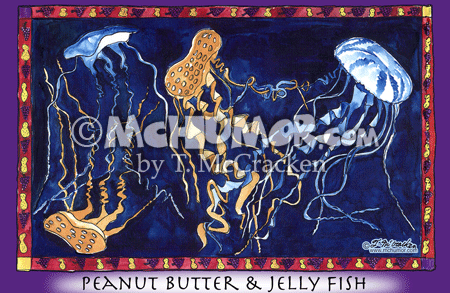 Jelly Fish Cartoon 8008H: Floating in the ocean are “Peanut Butter Fish & Jelly Fish. 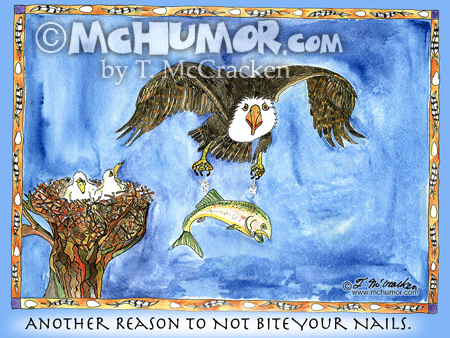 Eagle Cartoon 8005H: "Another Reason to Not Bite Your Nails." An eagle bringing a salmon to her chicks drops it right before she reaches the nest.